The AncientWolf and Master of #WolfKeep. A timeless being, steeped in magic and knowledge. He is kind and willing to help all. 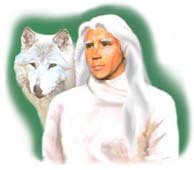 Father of Simon and Elandra, Pack Mate of the Lady Wenndolyne.